took place on Sunday the 31/3/2019 in Cathal Brugha Barracks. the Chief Celebrant was Fr Des Campion Chaplin to the Navy assisted by Deacon Jimmy Fennell. The following dignitaries were in attendance representing the different Organization / Associations. All our Branches were represented at our Mass. After the Mass all personnel in uniform fell in and the Colour Party were marched on. There were two Wreaths Laid one by the President of the INA and one by Col Darren Doherty UK Embassy. All attendees were then invited over to the Men's Club for finger food which there was a abundance of. Nevile Brennan( Dublin) and Tony O Halloran (Waterford) presented two cheques to Ollie O Connor CEO ONE Headquarters for Bru Na Bhfiann . 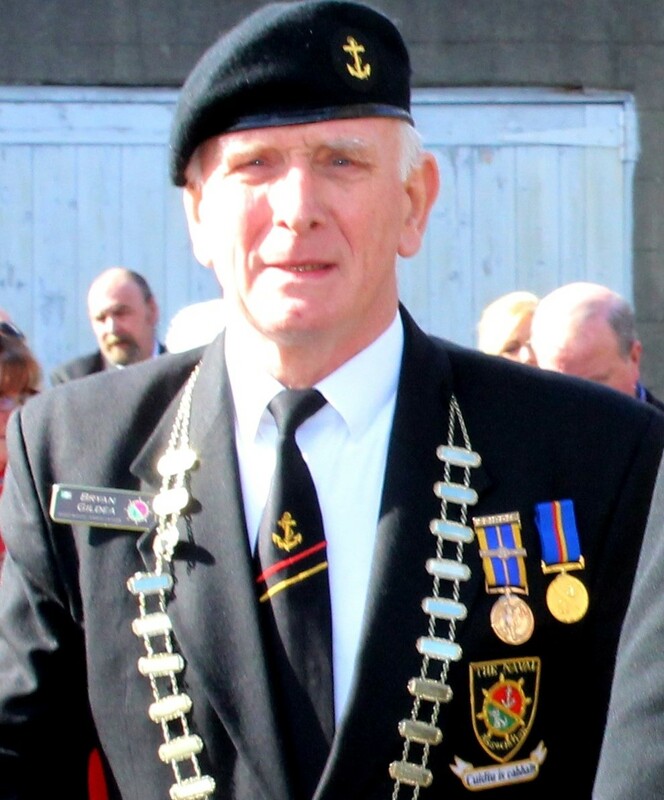 President of the Irish Navy Association. I would like to thank the following for all the help I received during the year our National PRO Terry Cummins, our Vice President Andy Mac Sharry Alan Ryan Secretary of the Dublin Branch of the INA.,Bernie Mc Guirk on the Social Committee. As this is my final report for 2018 can I wish all our members at home and away especially our members who we have not been seen for a while or are ill may they make a speedy recovery and we will see them in the new year A Very Happy Christmas and a Peaceful New Year to all. 1918-2018 commemorating 100 years of the end of WW1 in St Kevins Church,Glencree Co Wicklow. The day started with tea and coffee reception at 9.30 in the Glencree Centre for Peace and Reconciliation followed at 10.00 with a discussion Personal Reflections on "Lessons for a peaceful Europe 100 years after WW1"
13.20 Walk to German Military cemetery led by a Piper from the Air Corps where there was a Wreath laying Ceremony led by the German Ambassador to Ireland. This is my report for Armistice Day Centenary Commemorations 11/11/18. Three members of the Dublin Branch of the Irish Naval Association attended the Royal British Legion Ceremony in the Irish National War Memorial Gardens in Islandbridge Dublin. There was a large crowd in attendance including Ambassadors from Belgium, Australia,New Zealand,Britain ,France, also there were members of the Government and the judiciary. 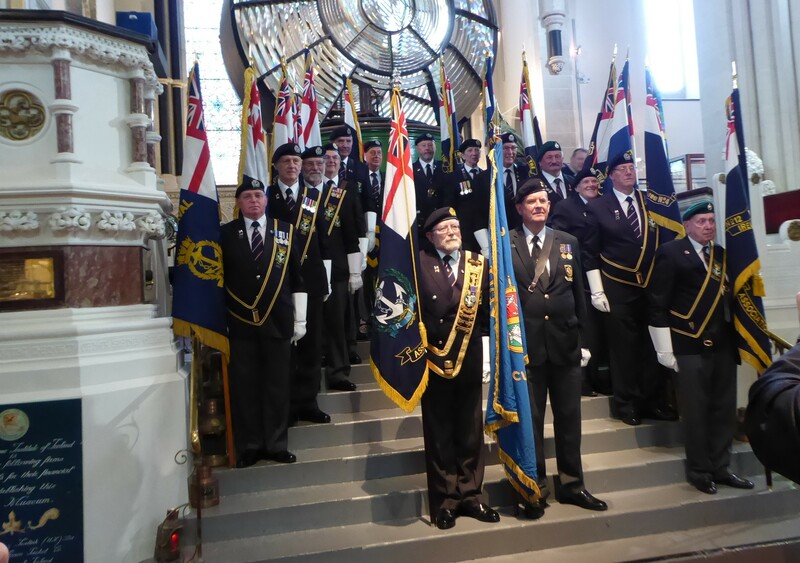 The Exhortation was given by Mr Brian Duffy Chairman RBL Republic of Ireland.After the official wreath laying Ceremony there then followed the laying of wreaths by other organizations in which the INA was the first to be called followed by the different Branches of the RBL. Then Brian Duffy invited the general public to lay wreaths / crosses/flowers in memory of their loved ones, there was a very large take up on this offer with people of all ages taken part. At precisely 1100 Hrs there was a fly pass of a WW1 Biplane which added to the occasion.The St Johns Ambulance had a large contingent in attendance with a Original St Johns Ambulance Truck and WW1 Army Lorry. The ceremony conclude with the playing of our National Anthem. This concludes my reports on the 100th Anniversary of the First World War Commemorations on Rememberance Day 2018. 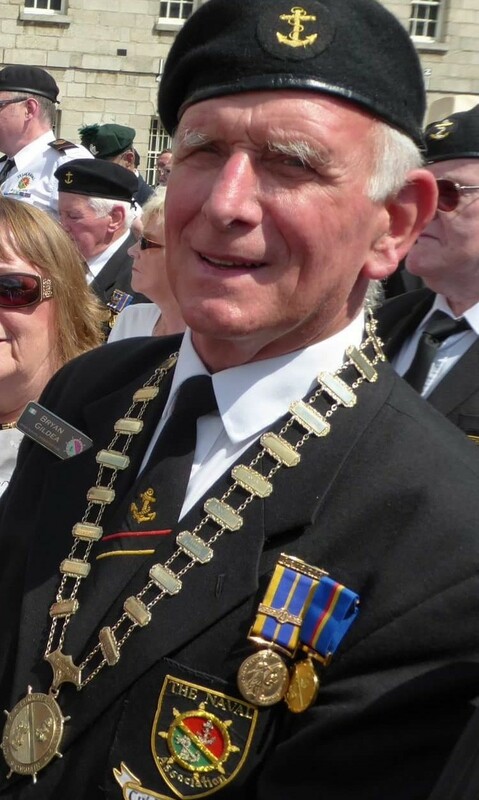 President of the Irish Naval Association . 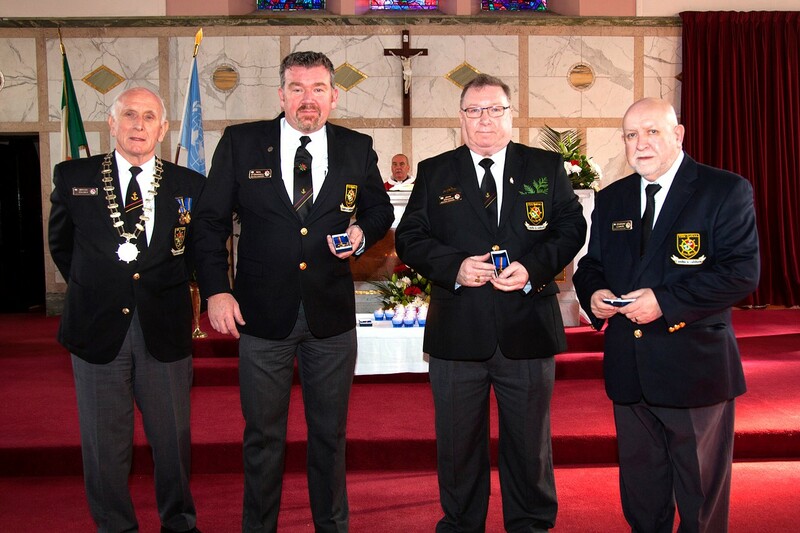 Five members of the Dublin Branch of the Irish Naval Association attended the Annual Mass for deceased members of the 5th Infantry Battalion in the Church of the Most Holy Rosary in McKee Barracks on Saturday the 3/11/18.. There was a large attendance of family and friends and we were given a very warm welcome. We fell in on the square with the members of the 5th Battalion for the wreath laying ceremony after which we marched to the garrison Church for Mass led by the UN Vets pipe Band. The Mass was said by the Mckee Barracks Chaplin Fr Pat Mernagegh aided by the former Army Chaplin Bishop Fields.After the mass we were brought over to the NCOs Mess for tea and coffee and the 5th Battalion retired members went on to have their AGM. Sunday 14th October 2018 Ten members of the Dublin Branch of the Irish Naval Association attended the ONE Rodger Casement Branch Annual Memorial Mass in Casement Aerodrome today. The Celebrant was Fr Bernard Mc-Cay Morrissey CF who has only recently been posted to the Aercorps Joined by Rev Adeline Patterson CofI, Our Chairman laid a wreath on behalf of the INA, We got plenty of compliments on our numbers and our turnout. There was tea / coffee biscuits laid on and the Museum was open for us, The day was beautiful sun shining meeting old friends what more could you ask for. This is my report for the Military Guard Ceremony held today at the National Memorial in Merrion Square Dublin. 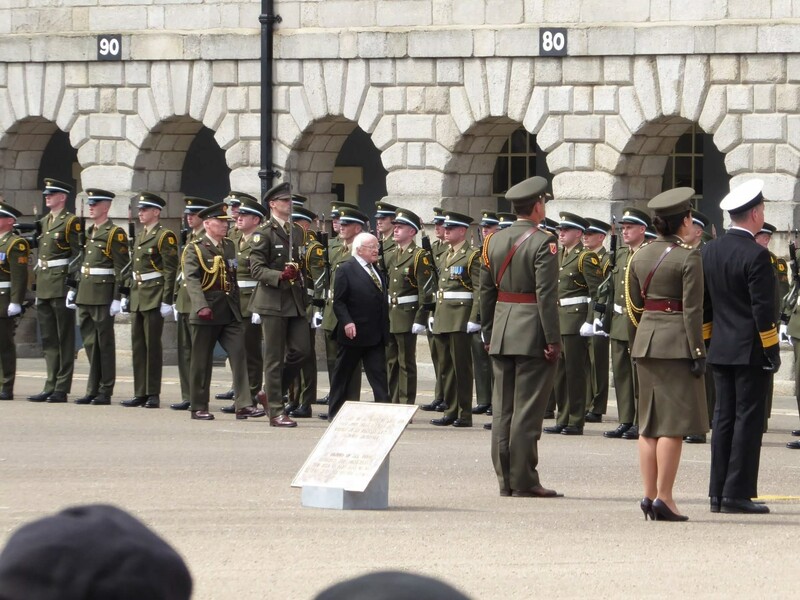 It is the National Memorial to members of the Defence Forces who died in the service of the State.The Flag Officer Commanding Naval Service (FOCNS) was in attendance along with one of the Deputy Chief of Staff Support (DSOS) Major General Kevin Cotter with his wife. The Units taking part today were Naval Service, Haulbowline and 1 Artillery Regiment Collins Barracks Cork. It was a lovely Ceremony lasting about a hour and in my opinion a larger crowd gathered than last year when we were soaked. The personnel who organize the Ceremony are trying very hard to encourage more members of the public to attend as it was advertised on a number of Radio Stations. The Irish Naval Association was invited to take part in Frances National Day to be held in the the Ambassadors Residence on Ailesbury Road Ballsbridge Dublin. The Ambassador H.E.Stephane Crouzat welcomed everyone reminding us that if Brexit goes ahead France will be our nearest European Neighbour. The invited guests included TDs Senators, Members of the Diplomatic Corps, Army Personnel,Business Leaders and Representatives from different religions. Music was provided by Sharon Shannon Band and Mellow Tonics Choir It was a lovely evening with plenty of sunshine and lots to eat and drink. I would like to thank our National PRO Mr Terry Cummins for making the necessary arrangements. This is my report for the Ceremony to Commemorate Anzac Day. 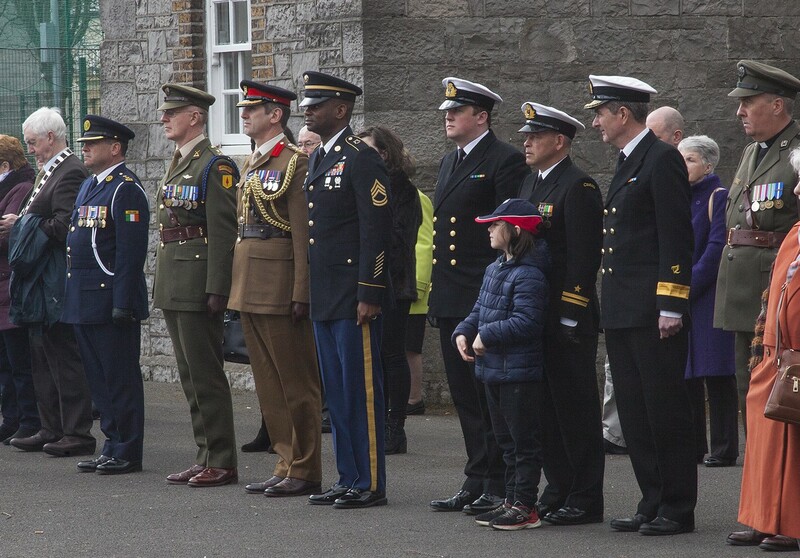 Wednesday 25/4/2018 eight members of the Irish Naval Association along with members of the Erskine Childers Branch attended the Anzac Dawn Service in Grangegorman Military Cemetery. There was a large attendance including the following, Mr Richard Andrews Australian Ambassador, Father Seamus Madigan Head Chaplin , Col Sue Graham CSC Australian Defence Force Rep, LT Col Mick Alexander New Zealand Defence Force Rep, Mr Charles Flanagan TD Minister for Justice and Equality, Minister of State for the Dept of Defence Mr Paul Kehoe TD. Vice Admiral Mark Mellett DSM Chief of Staff of the Irish Defence Forces. I would like to take this opportunity to wish Mr Liam Lyons a speedy recovery Liam has not been to well lately. 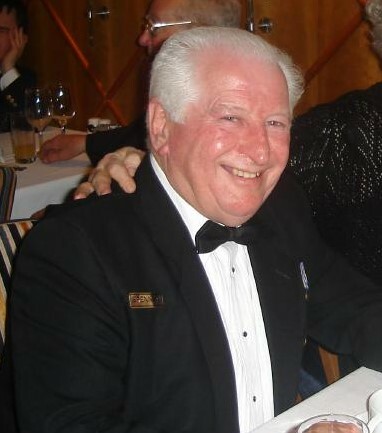 Irish Naval Association President Bryan Gildea report on AGM Saturday 24th March and our Annual Mass for the deceased members of the L/S Michael Quinn DSM Branch. The Clothing Officer Mr Gerry Mulligan reported that we have no Plaques and is trying source a supplier to supply small numbers. Our Vice President Mr Andy MacSharry passed around a template of a Certificate that could be used until we get Plaques . Under any other business we had fourteen points that Limerick submitted last year that they wanted clarification on which has still not been resolved it was decided to hold a special NEC meeting in June to resolve the outstanding issues. 25/3/18 Annual Mass for Deceased Members held in Cathal Brugh Barracks. The following were in attendance the CO of the Barracks Lt Col Ray Murphy , Lt Niall McCarthy representing the Flag Officer, Lt Conor Smyth representing the naval Reserve also the British Military Attach Col. Max. Walker, USA Military was represented by a Sargent from the USA Embassy, Mr Simon Manmourey Australian Embassy. The Irish Coast Guard was represented by Mr Eugune Cloonan Civil Defence Royal Navy Association, The ONE was well represented ,Also in attendance were members of the INA from Waterford ,Cork and Limerick. There was a large turnout of families of deceased members which is always good to see. Service Medals were presented to the following Mr Neil O Donnell, Mr John Graham and Mr Edward Larkin. I also presented two special awards to a Taxi man and a Fire Man who came to the assistance of Neville Brennan who is a member of the INA and was in a very serious car crash and the quick action of the Taxi Man and the Ambulance Man saved Neville's Life. Neville carries out a collection at our monthly meetings for Bru na Bhfiann the House in Nrt King St that caters for Ex Military Personnel, our Treasurer Mr Kieran Connors presented a cheque to Mr Ollie O Connor the Chief Executive of the ONE for the amount of 500E which was collected during the year. After the mass all our members fell in and the Colours were paraded I laid a wreath at our Memorial Stone outside the Church for our deceased members..We then retired to the Men's Club where we had Tea / Coffee sandwiches and plenty of finger food. I made a presentation of a bouquet of flowers to Mrs Martha O Neill who was our Organist on the day. I would like to thank the following for organizing the Mass the Social Committee led by Mrs Bernie Mc Guirk, the Dublin Branch Officers led by our Chairman Brian Farrell our Nat Sec Mr Declan Pendred our Nat Pro Mr Terry Cummins our readers Mr Sean Brennan, Mr Paudy Mc Caughey and all our members who turned up on the day. Thanks to one and all. 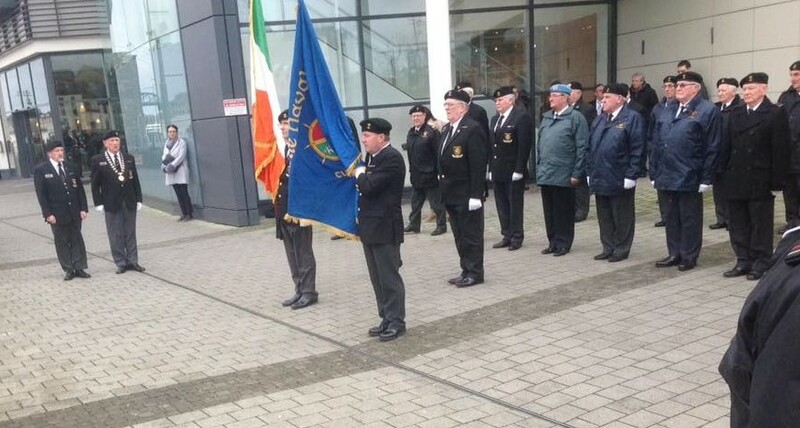 Sunday 28/1/2018 The Michael Quinn Branch of the Irish Naval Association Dublin held a Commemoration Parade at the Plaque in Drogheda that was unveiled a few years back by the President of Ireland Michael D Higgins to Honour the unselfish bravery and devotion to duty of L/S Michael Quinn (DSM) and A/B Paul Kellett (DSM). Michael and Paul were on board LE Deirdre which was at anchor during a severe Gale in Laurances Cove in Bantry Bay on the night of the 30/1/1990 when a distress call came in seeking help for a sinking Spanish fishing vessel the Nueestra Senora De Gardtoza with sixteen seamen on board that had gone aground in Bantry Bay. The two Seamen volunteered to go and offer assistance to the sinking vessel but as they were returning to LE Deirdre the Gemini they were in capsized throwing the two men into the water. 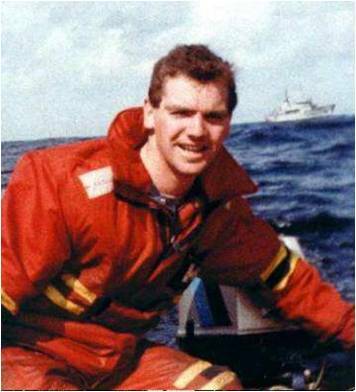 Paul scrambled over rocks and flagged down a passing Garda patrol and the alarm was raised a search was carried out for Michael but unfortunately his body was found the next day.The King of Spain also awarded the Spanish Cross of Naval Merit to both men for their Bravery on the night. The parade on Sunday was well attended with personnel from the following Organizations INA, UN Vets. RNA, ONE, and members of the Quinn family. Peter Quinn Michaels brother had arranged for sandwiches and finger food in a local Hostelry which we all retired to. Tuesday 20/2/18 Attended the funeral of Ms Patsy King in Dundrum Co Dublin. Patsy was the wife of Christy King who was a member of An Slua Muiri from 1958 and a member of the Irish Naval Association since 1992. Patsy and her family had regularly attended our annual mass for deceased members in Cathal Brugha Barracks.It was nice to see some of his old mates at the funeral. Wednesday 21//2/18 Attended the funeral for Ms Theresa Hayes ( Tess ) in Artane Dublin. Tess was the wife of Tom Hayes and mother of Aidan who is a SCPO in the Irish Naval Reserve, Tom was also in the Irish Naval Reserve going back a long number of years. There was a large attendance of personnel at the funeral from the following. 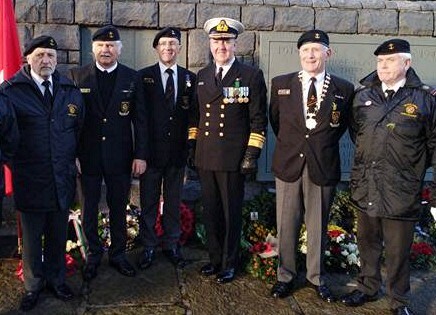 Irish Navy, Irish Naval Reserve, Irish Naval Association and the Erskine Childers Branch. There were two moments at the Graveside which is worth mentioning. 1 A bottle of Jameson was passed around with little plastic cups to toast Tess and her long life. 2 Her sisters and nieces broke into song which was lovely and brought a smile to every ones face.